Spencer Ware is coming off an overall grade of 70.7 last season, which is the lowest grade of his career since his rookie season back in 2013. Ware didn’t get much playing time in 2018, as he logged only 51 rushing attempts and 23 targets. As a backup running back for most of his NFL career, Ware has been serviceable when given the chance. Ware averaged 2.78 yards after contact last season, which would’ve ranked 28th out of 61 running backs if he had enough carries to qualify. He also forced nine missed tackles on just 51 rush attempts and forced six missed tackles on 21 receptions. Having just turned 27 years old, Ware can be a good change-of-pace back who is tough to bring down. 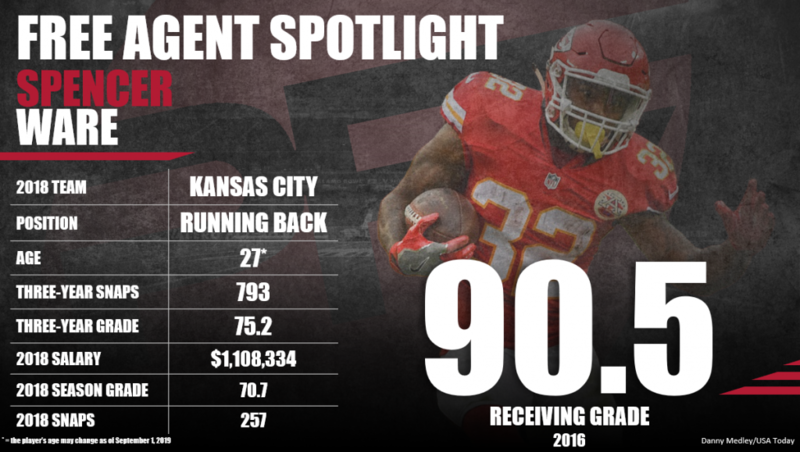 Subscribe to Pro Football Focus’ ELITE subscription to research Spencer Ware’s grades, advanced stats, snaps and more in Premium Stats 2.0.